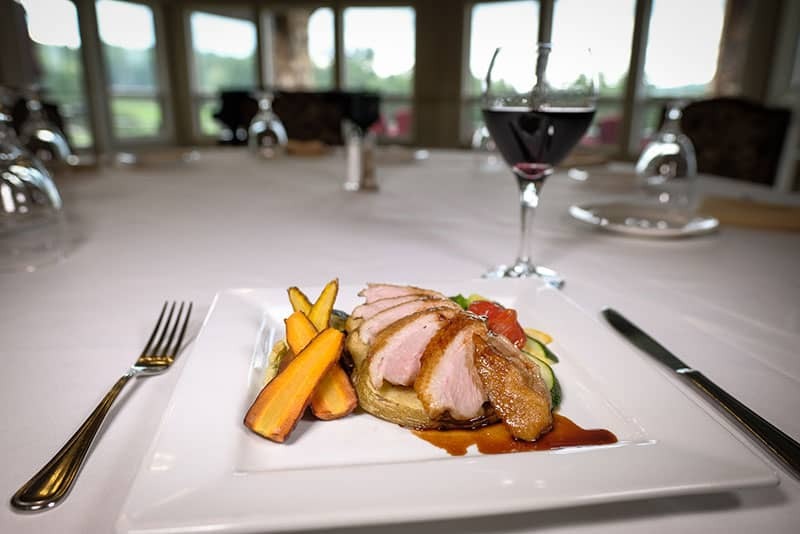 Quality dining is a hallmark of High Meadows Golf & Country Club. We know our members enjoy the seclusion and peacefulness of living in a small mountain community, but we also appreciate the high standards of our members when it comes to dining out. Therefore, we have made it our priority to always provide the highest quality food served with grace and friendliness, to make each meal one to remember. Our Executive Chef Nicole Burrell sets the tone for the dining experience at High Meadows Golf & Country Club. She comes to us with years of experience, both in restaurants and other clubs. But it’s more than her technical expertise that helps make the dining program at High Meadows so special. A Canadian of German Mennonite descent, Chef Nicole grew up in the kitchen, learning to bake and make homemade soups and stews from her family. She also has a love for gardening, and enjoys using fresh, local ingredients in the menus whenever possible. Chef Nicole is joined by a talented kitchen and wait staff, along with Bar Manager Angela Peros, who together help create the welcoming atmosphere for diners at High Meadows. Angela greets each person with a big smile as they walk through the door, and knows members well enough to have their favorite drink mixed and ready for them when they sit down. Each table is served by capable waitresses with a friendly smile and welcoming charm. The menu at High Meadows Golf & Country Club always contains a variety of options. There are fresh-made salads and comforting soups for members who just want a light meal. Then there are options of small plates or full entrees, the former includes items such as a juicy burger or small pork chop, while the entrees are where you’ll find tenderloin, smothered chicken, and the fish of the day. Each week there are also chef’s specials to add even more variety to the menu. One thing is certain, there’s always something new on the menu at High Meadows. Chef Nicole updates the offerings on the main menu every four to six weeks, to give members plenty of new options to try no matter how often you choose to dine at the club.